On Tuesday, lawyers for Laredo merchants argued the city's plastic bag ban conflicts with state law. The case has become a flashpoint in a roiling debate over the limits of local control, and the ruling could strike bag bans across Texas. SAN ANTONIO — Is a plastic bag a container? Does the definition of “solid waste management” include litter control? The 4th Court of Appeals in San Antonio heard oral arguments Tuesday in Laredo Merchants Association v. City of Laredo, in which the merchants claim the city's ban on single-use bags is illegal because existing state law regulating solid waste disposal pre-empts it. The law in question is a small piece of Texas' Health and Safety Code. Section 361.0961, passed into law by the 1993 Solid Waste Disposal Act, says that local governments can’t adopt regulation to “prohibit or restrict, for solid waste management purposes, the sale or use of a container or package in a manner not authorized by state law.” Arguments on Tuesday focused on the definitions of several phrases in the law, especially "container or package" and "solid waste management," and what, precisely, the Legislature had intended. The merchants' case is the first challenge to a Texas municipality’s bag ordinance to make it to court. The Texas Retailers Association filed a suit against Austin’s bag ban in 2013 but later withdrew its petition, and Dallas repealed its bag fee after plastic bag manufacturers sued last year. The Laredo merchants sued the city in March 2015 and appealed to the 4th Court after the 341st Judicial District Court in Webb County sided with the city last June. A victory for the merchants could mean the overturning of local bag regulations across the state, while a win for Laredo could encourage other cities to pass regulations of their own. Regardless of the Fourth Court’s decision, however, the case and its fundamental issues may not be soon settled. Kathleen Hunker, a senior policy analyst at the Texas Public Policy Foundation, which filed an amicus brief in support of the merchants, said she expects the case could wind up in front of the Texas Supreme Court. While the part of the Health and Safety Code in question clearly places restrictions on local regulatory authority, it doesn't define containers and packages and doesn't specifically mention plastic bags. The Code enumerates activities that are controlled as part of "management," including the generation, transportation, and processing of solid waste — but not the prevention or reduction of litter. Laredo says plastic bags are neither containers nor packages, that the bag ban was not imposed for solid waste management purposes and that legislators didn’t intend the 1993 act to regulate plastic bags. The Merchants’ Association disagrees. Jim Lehman, an attorney for the merchants, countered that the Legislature's intent in the 1993 law was to prevent the rise of a patchwork of local regulations — like the one created by the various bag rules in different cities. On its face, the case is a fight over flimsy pieces of plastic. But the series of amicus briefs filed on each side establish that a much weightier issue is at stake: How much power do local governments have to establish regulations that affect commerce? Three Texas state senators and 17 state representatives, all Republicans, filed an amicus brief last week in support of the merchants, arguing, like the Texas Public Policy Foundation, that state law pre-empts the bag ban. The Texas Municipal League filed a brief in support of the city. Executive director Bennett Sandlin told the Tribune that the bag issue is one where local control is particularly important because different cities have different environmental concerns; Fort Stockton, for example, cited cattle deaths from ingesting plastic as a reason for the bag ban. The implications of the local control dispute go beyond plastic bags and extend to ride-hailing apps, energy, rent control and other areas where municipalities have sought to pass stringent regulations. Last May, Gov. Greg Abbott signed into law House Bill 40, which limited local regulation of drilling activities after Denton voted to ban hydraulic fracking in the city. Recently, legislators have vowed to address local rules on ride-hailing companies like Uber and Lyft. “We’ve got a Legislature that used to believe in local control and now, some of them, all they believe is control of the locals,” Sandlin said. “We’re facing it not just in plastic bags but any number of issues." Bag ban detractors have explored the possibility of invoking the health code to strike down local bans for years. In 2014, state Rep. Dan Flynn, R-Canton, one of the legislators who joined the amicus brief siding with the merchants, asked then-Attorney General Abbott to issue an opinion on whether anti-bag laws violate state law. Abbott wrote that the answer depended on the definitions of “container or package” and “for solid waste management purposes” — the same point of contention between Laredo and the merchants. He concluded that a court would likely decide that a plastic bag is a container, but bag regulations may not necessarily have a waste management purpose. Laredo argues that its ban was designed to beautify the city and reduce storm drain clogging, not to manage solid waste. Supporters of the bag ban have charged the anti-ban legislators with meddling in local affairs. “It’s ironic because they decry federal interference in Texas, and yet they’re doing the same thing from Austin, the capital, in our own local issues,” said Tricia Cortez, executive director of the Rio Grande International Study Center, an environmentalist group in Laredo. Huffines said that regardless of what happens in the courts, he’s certain there will be legislation addressing the proper limits of local authority in the next session, which begins in January. Meanwhile, the environmental effects of the bag regulations have faded into the background. 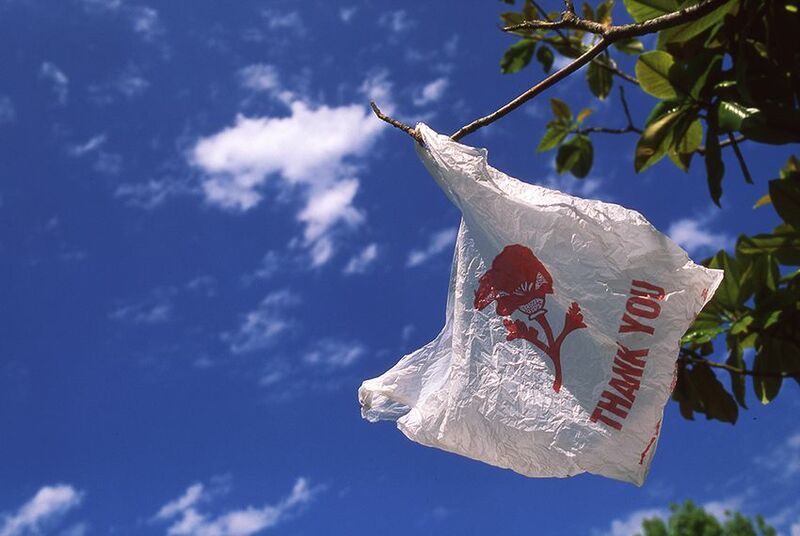 Andrew Dobbs, legislative director for the Texas Campaign for the Environment, called bag regulations “a great idea,” but a “side issue” relative to other environmental issues in Texas. “If I want to get every camera in town to show up, I talk about bags,” Dobbs said. Keith Hottle, clerk of the court, said the court typically takes three to six weeks after oral arguments to issue decisions but could need more time depending on the complexity of the case. Disclosure: The Texas Municipal League, the Texas Retailers Association and the Texas Public Policy Foundation have been financial supporters of The Texas Tribune. A complete list of Tribune donors and sponsors can be viewed here.